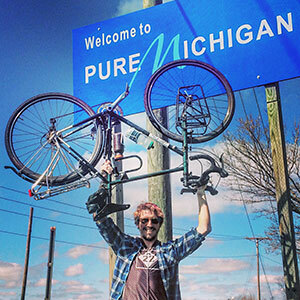 Pauly Hurlbert at the Michigan border on his way home Planning to try Smart Commute Week next week? It just might change your life. Last year, Pauly Hurlbert had never ridden his bike further than Traverse City to Suttons Bay — a long-ish commute distance. Yet on September 10, the NMC aviation alumnus and certified flight instructor embarked on a West Coast bike tour from Vancouver, British Columbia. 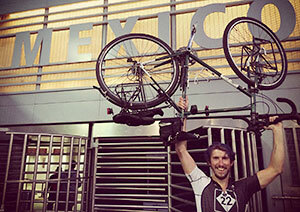 He wasn’t sure he’d like pedaling thousands of miles, but keen on the personal discovery and adventure he anticipated along the way, Hurlbert committed to ride to Tijuana. By the time he reached the Mexican border November 28, Hurlbert not only liked bicycle touring, he was hooked. He turned east, bound for Florida. After a month there he turned north, arriving home in Traverse City in early April having logged 6,138 miles. “Border to border, coast to coast, and then back home,” said Hurlbert, a 2008 alumnus originally from Kalamazoo. He carried about 120 pounds of gear and camped about half the time. Now back in a more regular routine that includes bartending, playing music and teaching flight instructor students, Hurlbert, 30, said he applies lessons from the bike tour daily. Chief among them is patience, something that can be hard to impart to students always anticipating what comes next. Another lesson: Deliberately step out of your comfort zone. Hurlbert practiced this from day one of his trip, which at 65 miles was twice as far as he’d ever ridden before. “It makes you more comfortable with everything,” he said. He loves to see students taking that risk, recalling one international student who arrived a few years ago with minimal English. This spring, she took her exam to become a flight instructor. Hurlbert isn’t sure what’s in store for him after the summer semester. But it’s likely he’ll eventually climb back aboard Charlotte, the road bike that carried him to innumerable scenic vistas, milestones like the Mexican border, and personal highlights like riding down Morgan, his childhood street in Kalamazoo. Hurlbert recalled traversing it on training wheels. They say there is no such thing as a free lunch … but you can get a free breakfast! How? Join us for the 22nd Annual Smart Commute Week June 6-10. What is Smart Commute Week? It’s an annual celebration, held during the first full week of June, consisting of events promoting cycling, walking, taking the bus and carpooling. Free daily breakfasts are hosted at various locations around town for smart commuters, including a Tuesday breakfast at the Dennos Museum Center.